It is on the evening of Vasant Panchami that many Hindus (particularly the West Indians from Trinidad and Guyana) perform puja and plant what is referred to as Hori. This is when the first piece of wood is placed to build and big bonfire in preparation for Holi. As each day approaches, additional pieces of wood are also added. It is on Holika Dahanam when the bonfire is lit as a symbolization of the burning of Holika. Vasant Panchmi also marks the Birthday of Sarasvati Maa who is the Goddess of Wisdom. Sarasvati bestows divine speech, divine intellect and learning abilities. Her four hand represents the four aspects of learning (Mind, Intellect, Alertness and Ego). 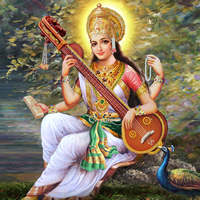 We also pray for Sarasvati Maa to bless us in the area of musical arts. Sarasvati Maa is also known as Shaarada, VaakDevi, and VaakaVaani Maa. She is the consort of Lord Brahma (the Creator). Her Vaahan (vehicle) is the White Swan which is a symbolization of purity. O Mother Saraswati, my humble prostrations to you who are the fulfiller of all my wishes. I start my studies with the request that you will bestow your blessings on me.